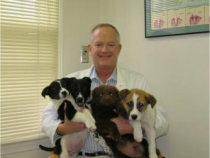 Courtesy photo Rhode Island veterinarian Jack Civic, DVM, holds four lucky San Luis Valley puppies who found new homes in Rhode Island. ALAMOSA, CO: Four lucky pups from the San Luis Valley recently made the trip of their lives – all the way to Rhode Island. Leonardo, Ike, Mike and Paco, names given them by the Valley Humane League that rescued them, faced an uncertain future. One of the pups had been picked up as a stray. The other three puppies had been abandoned in the mountains with an older dog. Although not their mother, the older dog was faith fully watching over them, Valley Humane League President Diana Hamilton said. The three abandoned puppies wound up at the Valley Humane League’s shelter in Estrella several miles south of Alamosa. The other was at the league’s shelter in Monte Vista. Between the two shelters more than 1,370 animals made their way back to their owners or into new loving homes in 2007 alone. The league, comprised of volunteers, is always looking for good homes. 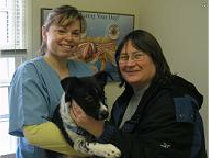 By chance, two members of the Valley Humane League Board, Hamilton and Trish Cunningham, happened to be at Green Spot in Alamosa at the same time as a veterinarian from Rhode Island who had come to the San Luis Valley to visit his friend and fellow veterinarian Dr. Warren Deal. 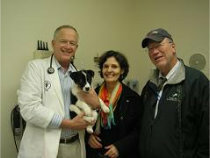 The league board members began visiting with Dr. Jack Civic who operates Newport Animal Hospital in Middleton, Rhode Island. 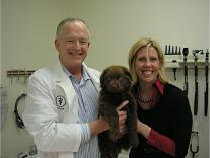 Dr. Civic told the league volunteers that because of Rhode Island?s strict spay and neuter laws few puppies are available for adoption in that state. He said he would be interested in transporting some of the league’s puppies to Rhode Island. Hamilton said after Dr. Deal donated health checks for the four puppies, they were ready to make their cross-country trek to their new adoptive homes. The pups flew out of Albuquerque, N.M., to Rhode Island where they arrived late at night but were met by eager volunteers who were excited to greet them. “They were fighting over who was going to pick them up,” Hamilton said. Ike, also known as “cow” because of his black and white Holstein-type markings, went to Darlene and Steve who renamed him Tex. Paco, renamed Jackson, went to the Taylor family. He now spends his days in a large yard with his loving owner and another young dog as a playmate! 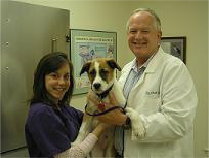 Mike , renamed Carl, went home with one of the Newport Animal Hospital technicians! Michele, who fell in love with Carl at first site, has been taking him for long walks on the beach. Hamilton and Valley Humane League board member Sandy Varner said not only did Civic pay the $300-plus airfare for the puppies to fly to Rhode Island, he also spayed and neutered them and sent the adoption fees back to the Valley Humane League. Hamilton said Civic told the league board he thought this would just be the beginning of an ongoing partnership. By the way, the older dog who faithfully cared for the abandoned puppies until they were rescued has also been adopted.